My righth-grade home economics classes was partnered with other short term subjects and only lasted for eight weeks. I could hardly wait for the class to start. When I walked into the home ec. room, I was in my element and I didn't even know what an element was! We were taught basic cooking techniques and the lessons were comfortable, and exciting, new and yet, familiar. Many of the instructional concerns focused on how to mix and measure properly, the steps to effectively clean our work areas and how to be careful with potentially dangerous gas appliances. To this day, the smell of a gas oven being lit takes me back to that junior high home-ec room. One of the most amazing recipes the teacher taught our group of beginning cooks was baked eggs. I had never even heard of a baked egg. I knew fried, scrambled, poached, hard and soft boiled, deviled eggs and even omelets - but not baked. My mother let me make baked eggs for our family. They were little eggs, nested in custard cups lined with bacon and drizzled with milk. Today, I know this was an amazingly unhealthy concoction. On the plus side, I only made those baked eggs twice - they took too long to cook and my fascination with the recipe wore off quickly. (Baked eggs are also known as shirred eggs). So many great recipes call for eggs and today's recipe is for an easy and almost foolproof way to hard boil them. I wish someone had taught this technique to me when I was raising my children as it would have saved so many eggs from being rendered unusable for dying at Easter. 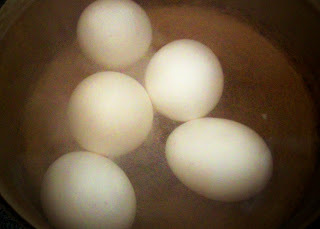 Place desired amount of eggs in a pot and add enough COLD water so it measures an inch above the eggs. Turn heat on HIGH and watch for water to boil...Immediately, remove pot from heat and COVER. Let eggs stand for 24 minutes, covered. When the time is up, immediately, pour off the hot water and stop the cooking process by running cold water over the eggs.Tap an egg on the counter-top to crack the shell...then, roll the egg around to loosen the shell further and peel. If you hold the egg under running, cold water the shell will be easier to remove. Hard cook eggs and cool. Fill a custard cup or glass with water and heat in microwave for 1 minute on HIGH. Remove cup and add 1/4 tsp vinegar and a few drops of food coloring. Carefully place egg in water mixture and roll egg around gently. Let egg sit for a few minutes...make sure it colors evenly. Remove from water using tongs and place on a paper towel to dry. Refrigerate eggs. 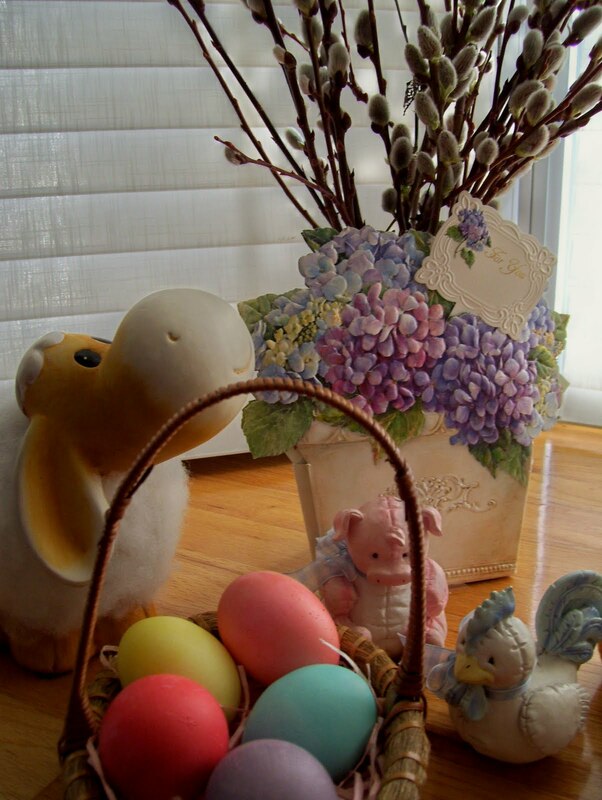 Marian wrote: Your mention of a class in Home Economics reminded me of my egg experience there. We did not make baked or shirred eggs; we made goldenrod eggs. I believe this was hard-boiled eggs mashed, whites and yolks together, and served on toast. I guess this would be similar to an egg salad sandwich, but I don't remember any mayo being involved, or pickles.